Credit market conditions remain extremely tight for all business sectors, including law firms. I recently got a new perspective on this issue from a client who is handling major contingency cases. The cost of funding these cases has gone up so much that he is financially strapped. Contingency fees, of course, are often used in personal injury and collection matters, where the lawyer's fee is a flat percentage of the value recovered for the client. Until there is a recovery, the lawyer has only a cash outflow for handling the case and has to bear all the associated costs. What costs are we talking about? First is the cost of labor, the attorneys and staff required to handle the case. After all, even without money or fees coming into the firm for the matter, people in the firm expect their salaries to be paid. Also, all the firm's cost of operation continue, such as rent, insurance and all the other items necessary to keep the lights on and doors open. All these costs, one might say, are expected. However, in large contingency fee cases, one defense objective is delay. 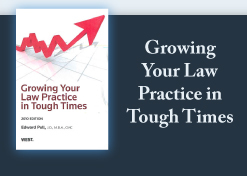 This can cause the case to drag on, placing even more financial strain on plaintiff's lawyers. The longer the case continues, it's also likely that more expert witnesses will be needed for the plaintiff side to counter defense experts. The cost of this kind of battle can be significant. What is a plaintiff's lawyer to do? In the past, there have been finance companies interested in lending on contingency cases. But any kind of lending institution today is only interested in a sure thing - hardly a description of contingency litigation. In the film Erin Brockovich the attorney had to put a mortgage on his home to finance the case and ultimately had to associate in a larger law firm with a larger pocketbook. That, however, is not always possible. Normally in large firms, compensation is based on hours worked and dollars collected. How can you compensate lawyers who bring no money into the firm, and, in fact, are responsible for many dollars flowing out of the firm for compensation and expenses advanced to sustain the lawsuit. Then, if the firm is successful, more problems ensue. How much should the lawyers working on the matter receive? Didn't the firm advance the costs, not the lawyers? What share of this victory should the other lawyers, whocarried the firm between successes, receive? The bottom line is that contingency fees are best for the lawyer skilled at analyzing cases and accepting those with a high likelihood of success. And in today's financing environment, it is wise to take such a case only when you know you have the cash reserves to see it to conclusion. In a recent post to LawBiz®Blog, I commented about the organized bar's need to represent not only the public (protect) but also its members (services to help be more effective, efficient and profitable). I suggested that most, if not all, bar associations have staffs (and many members of the governing bodies) that see the bar only in light of public protection. In effect, these people see the members as adversaries! Take a look at my new blog post about California's legislature seeking to convert (it does have the power to do so) the bar association into an agency solely for the protection of the public and removing lawyers from its governing body. Watch out lawyers! As said in a different context, by Pogo, "We have met the enemy, and he is us..."